Welcome! 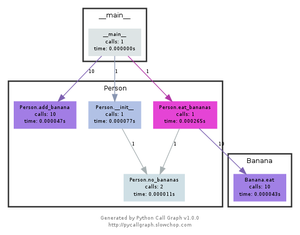 Python Call Graph is a Python module that creates call graph visualizations for Python applications. Click on the images below to see a larger version and the source code that generated them. The latest version is 1.0.1 which was released on 2013-09-17, and is a backwards incompatbile from the previous release. The project lives on GitHub, where you can report issues, contribute to the project by forking the project then creating a pull request, or just browse the source code. Support for Python 2.7+ and Python 3.3+. 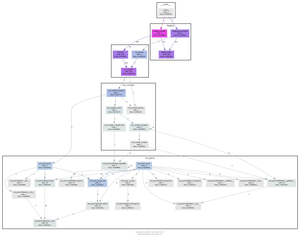 Static visualizations of the call graph using various tools such as Graphviz and Gephi. Execute pycallgraph from the command line or import it in your code. Customisable colors. You can programatically set the colors based on number of calls, time taken, memory usage, etc. Modules can be visually grouped together. Easily extendable to create your own output formats. 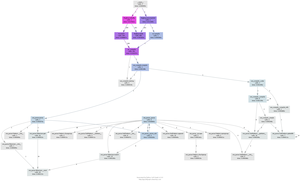 The following examples specify graphviz as the outputter, so it’s required to be installed. They will generate a file called pycallgraph.png. © Copyright 2007-2013 Gerald Kaszuba, et al.. Created using Sphinx 1.1.3.